I love this time of year. Heading towards autumn, but the sun still breaks through and the trees seem to shine. We went foraging on Walthamstow Marshes eager to get elderberries but couldn’t find any. However we stumbled across a bumper crop of rosehips. We were delighted with such a heavy bag (1.5 kilos) of goodies for free. I did feel sorry for the birds as we took their lunch but hopefully as we’re trying to be very frugal with the precious finds, we’ll avoid a scene from the scary film ‘The Birds’. Alfred Hitchcock was born in 1899 just down the road in Leytonstone. When I was a young child I first watched this film and was terrified but if you look at it now you can even see the puppet strings on the birds – not so frightening when you’re 30+! 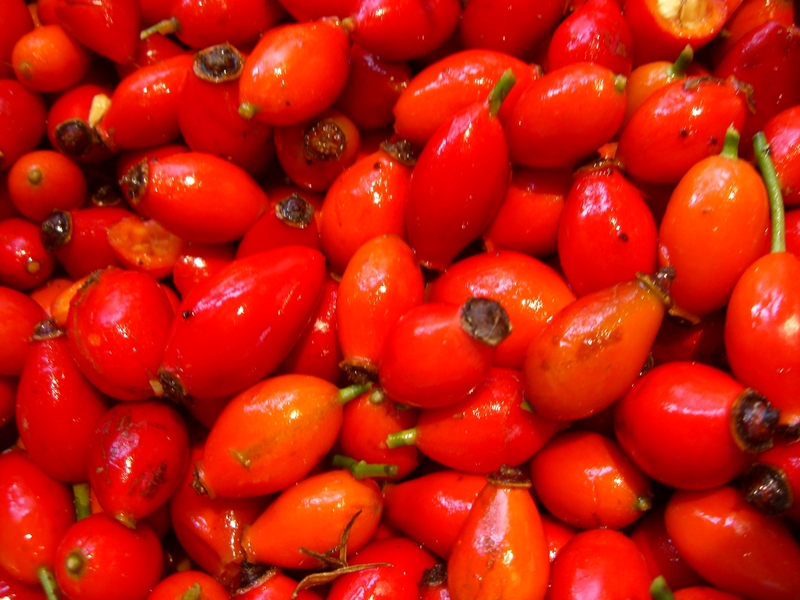 Every year we make rosehip syrup which as it is full of vitamin C fights off winter colds and sniffles. Pick over the rosehips removing the stalks. Wash thoroughly, then in batches mince in a food processor. Get a big pan and start boiling the water, add the rosehips. Cook until soft, leave the liquid to cool in a covered pan to release all the juice and flavour. Next day strain the liquid through muslin to get rid of the hairy rosehip residue. Measure the juice, you should have about a litre. Get that big pan out again, add the juice and the sugar. Heat and stir until the sugar has all dissolved then boil for 4-5mins. Then pour while it is still hot into warm, sterilised (through the dishwasher works) bottles. We reuse old wine bottles with a screw cap and if you seal them well it will get you through the dark winter months hopefully cold-free. I use the syrup as a cordial or naughtily I add it to cava to make Bellini’s while dreaming of summer. 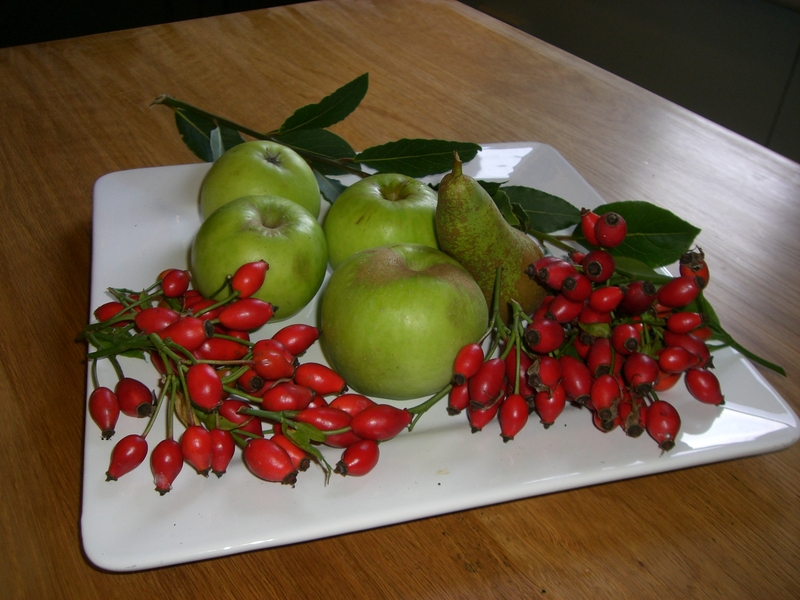 I don’t want to throw away any of the rosehips. I could buy a food dehumidifier however in the absence of such an investment I’m hopefully going to dry out the cooked rosehip residue by baking it in the oven. I want to try using this in gravy and also for tea (both will need to be well sieved to avoid the throat irritating hairs). Very frugal if it works out! This entry was posted in Recipes and tagged Alfred Hitchcock, cordial, frugal, Leytonstone, Rose hip, syrup, vitamin c, Walthamstow Marshes. Bookmark the permalink.